This restaurant El Mercado Miraflores is situated less than one hundred metres from my home in Lima and yet I did not know of it’s existence until about a year ago. There are no big signs announcing its presence onto a non-descript street called Avenida Hipólito Unanue. This location is about ten minutes by taxi from the touristic heartland of Miraflores, Parque Kennedy. However, it matters little about the tourists here, because this is without doubt a restaurant of local Limeños. 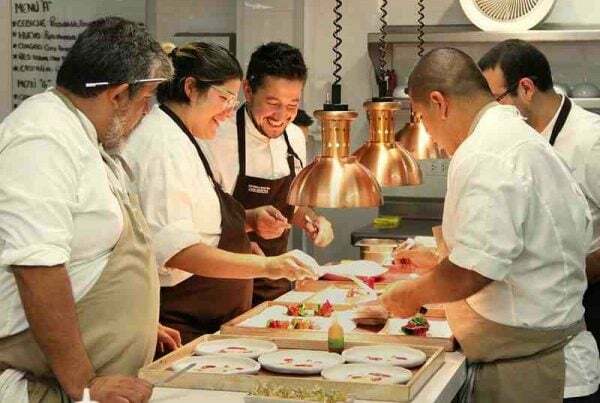 A place where celebrity chef Rafael Osterling extolls the virtues of local seafood in Miraflores and lifts his customers to rapturous new heights. These are but a part of the reason this restaurant is the number one seafood restaurant in Miraflores Lima. 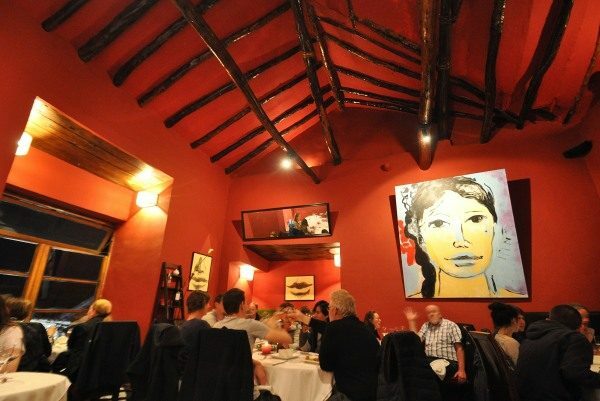 You will often hear this restaurant before you feast your eyes on it, as you hear the chatter of happy customers. On entering you are struck by the feeling, wow this is busy, and it is. In typical local practice, as a seafood restaurant in Miraflores, it opens only for lunch and that means Tuesday to Sunday 12.30 to 5 p.m. Restaurants here serving seafood only open within these hours as they capitalise on the peak freshness of the local catch. The wine list is geographically extensive and far better in my opinion than that of the nearby famed La Mar Restaurant. Initially my choice was for a wine from the Alto Adige area of Northern Italy. This region produces wonderful white Pinot Grigio and Gewürztraminer wines and in a past life I often visited there. A truly stunning region amid the towering Dolomite Mountains of Northern Italy. Alas today the chosen wine was not available and the waiter brought me an alternative, a white from Alba, Piedmont. I tasted it and politely declined as it was far to dry for my liking. I decided to take a leap of faith and opted for a red Cabernet Franc from the menu. A bottle of Frank! Barollo. Not to be confused with the great reds of Barolo in Piedmonte this wine comes from the Piave region north of Venice. The friendly waiter duly arrived and this wine was simply amazing with my dish of tuna steak, I don’t often say that. Go and try it for yourself, if you like a complex and robust wine I am sure you will enjoy it. Any restaurant worthy of the accolade of number one seafood restaurant in Miraflores Lima must have an expansive wine list such as here. Myself and my family shared this meal and we opted to share a starter and then to head directly to the main courses. For the starter we shared a delicious Taco anticuchero of cod, avocado and black bean. Other choices include octopus, crab and shrimp and all are about S/35 Peruvian soles. The main courses, all again seafood inspired are a wide array including those we tried of a Tuna Pepper Steak, Seafood Ravioli with beans and a yellow chilli sauce and a Chiclayo Duck with rice. Main courses cost about S/65 Peruvian soles. The duck is one of the few non-seafood options and my wife was well impressed by its presentation and flavours inspired by the northern city of Chiclayo in Peru. The food here is well presented but not overly so; the flavours of the natural ingredients are allowed to shine through and this is a prime reason it wins the prize of the number one seafood restaurant in Miraflores Lima. 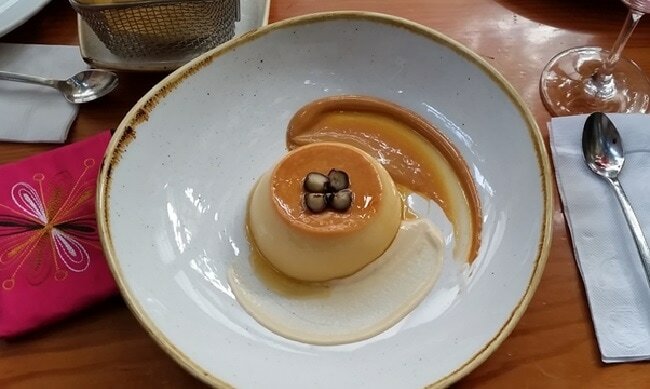 Dessert consisted of a simple flan or crema volteada as it is known in theses climes. The dessert menu also offers many based on the local fruits such as granadilla, chirimoya, and maracuyá (passion fruit). However, if there is one fruit and flavour you must try as a visitor it has to be the lúcuma fruit. It on the menu in a “triumvirate” and the local Andean fruit is the hero of local Limeños here in Peru. 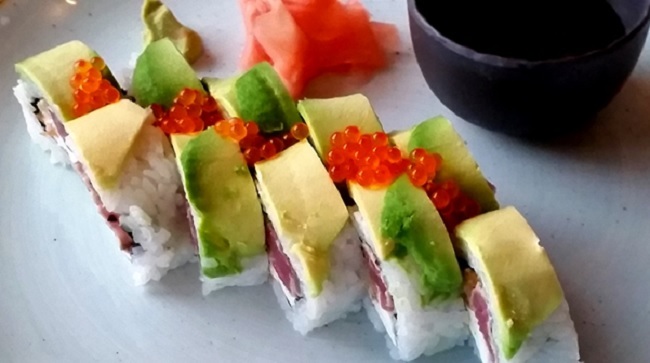 This restaurant thrives on the freshness of its produce and its proximity to the Pacific Ocean and the seafood ports of both Callao and Chorillos ensure that’s a guarantee. I have been fortunate to visit very many restaurants in Peru and at the moment this really is my number one. Why? The reasons are manyfold and number one is authenticity. This is a comfortable restaurant but not pretentious or lavish in its decoration. It attracts locals, albeit professional ones from Peru’s new burgeoning middle class. This restaurant it’s staff and clientele are not pretentious, and whilst the air of the restaurant is busy and business like, it is not audacious or pompous. You are here to converse and enjoy the flavours of the finest Peruvian seafood. This is the primary reason to call this the number one seafood restaurant in Miraflores Lima. My advice here is to set sail for this restaurant as a must visit seafood restaurant in Miraflores. They do take reservations for some tables but you can also come before the restaurant opens and join the queue, and there will be a queue! Patience is a virtue when there is something worth waiting for! 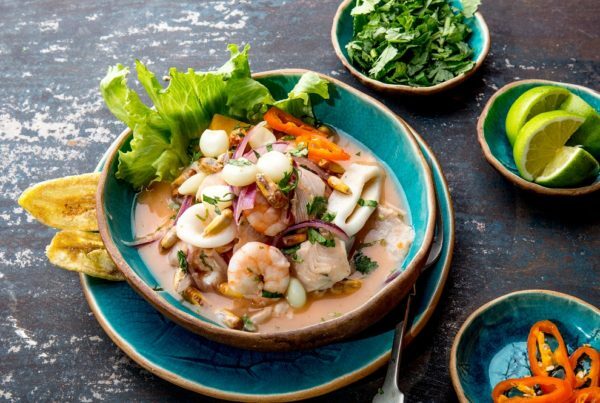 Why not combine this enticing journey in Peruvian food with a truly memorable luxury Peru vacation by contacting the experts at Totally Latin America. Address: Avenida Hipólito Unanue 203, Miraflores, Lima.